In this post, I will tell you about some blogging tips that I have done myself and learned from others' mistakes. 1- There is a lot of disadvantage in Regular Blog update. 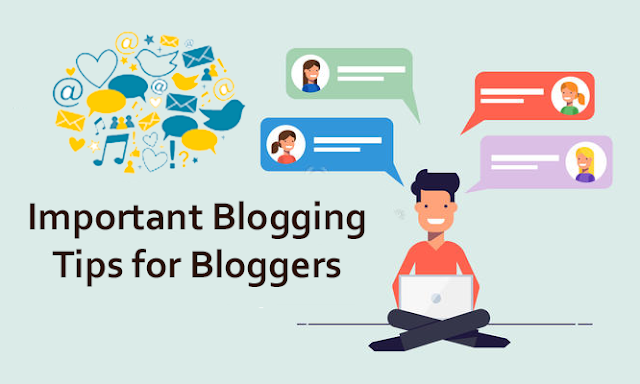 The main reason for most people failing in blogging is to do regular Blog Update. If you think that after you update 1-2 post in a week, your blog will be successful, then you remove this thing from your heart. If you start a new blog then you should keep updating that blog on daily basis on a daily basis. If you daily update your blog then you will have two advantages. The first advantage is that once you visit your blog, it will become your regular reader and it will come daily to read a new post on your blog due to which the traffic of your blog will increase. And the second advantage is that Google likes the blog or the website too much, which keeps updating something every day. Therefore daily updating will increase ranking in your search engine and you will get more traffic from the search engine. 3- Google easily recognizes the good content. If you are thinking that you can fool Google, then you are thinking wrong. Because Google is smarter than you. So while your content is not good and quality, your post will not rank at the top of Google. Google bots easily recognize spam and spam content. So do not ever try to fool Google. Always put good content on a blog so that Google likes your blog and index it quickly. 4. Visitors do not wait to come to your blog. If you are thinking that after creating a blog, any visitor waits for your blog to come, then you are thinking wrong. Because the user is smarter than you. And unless they find your blog helpful, they will not visit your blog daily. If you want your visitor to wait for your blog to come, you will need to publish content on your blog that will win their mind and force them to visit your blog. When you start blogging, take care of one thing that blogging is a long-term investment. Where you can not get success in one day or one month. You can take time to be successful in blogging. As far as blogging is concerned, business traffic of your blog gradually increases since 30 good articles. In other words, as much content, as you write and publish in blogging, the better you will get results. Good things are not available in this world very quickly, so you can also find time to be successful in blogging. In this way, we can say that blogging is a long-term investment business. Where you get success, but you do not get Overnight success here. When I started my first blog, I did not pay much attention to the theme of the blog. And I used to use a very annoying theme in my blog. When I changed the theme of my blog, after 1 month of my blog there was a lot of improvement in my blog. Therefore, the theme of the new blog is a lot of matter. You should choose the theme of your blog very well. Blogging is something that nobody can ever learn to complete. If you think so, then your blog will never be successful because no one can keep complete information about blogging. The main reason for this is that there is something changing in the blogging daily. And new things come in daily blogging. So if you want to run your blog successful then you should learn about new things about daily blogging. 8- Writing and Editing only does not require blogging. If you are creating a business blog then you do not need writing and editing skills only. Apart from this, there are many things about which you should keep good information. You should come to understand the data by analyzing the data and according to it, it should also come and do not have to do. Along with this, you should come to re-design your blog. There should also be a call-to-action in your content and in addition to these, you should also get email marketing and social media marketing. All these things are many things that you should know about. So, after starting a blog, try writing about all these things in addition to writing and editing. To create a successful business blog, you should know every little thing about blogging. Apart from these, there is a blogging tip that should be kept in mind while starting a new blog. So you share it in the comment box. Along with this, do not forget to share this post with a new blogger. i want to dail update in this site .